Malé City Council Deputy Mayor Shifa Mohamed says that controlling today’s floods (October 30) is made more difficult with the current condition of the capital’s roads. Shifa told Minivan News that poor planning and a lack of maintenance had exacerbated the floods occurring across Malé City today (October 30) after heavy downpours in the morning and the afternoon. “The drains on the sides of the roads have not been properly emptied for over 25 years. There are all sorts of junk in the drains which is clogging up the drainage system leading to floods with the slightest bit of rain,” said Shifa. Many major roads in the the capital are currently flooded disrupting transportation with much of the south-west of the 6km sq island under water – rising a foot high in many places. Te department of meteorology has explained that 58 millimeters of rain were recorded in the capital during two hours this morning. The MET office predicts heavy rain in the next two days. However, wind speeds are expected to be moderate. Local media reported that police vehicles were being used to transport students, left stranded across the city, to and from the schools. Communications were also affected, with heavy thunder this morning damaging Dhiraagu and Television Maldives equipment, leading to network problems and delays in the broadcast from of the state television channel. Shifa said that the Maldives National Defense Force (MNDF) is assisting the council with draining the water by setting up pumps at locations most severely affected by the floods. “We have also diverted half of our waste management team to assist the MNDF in controlling the floods and requested assistance from the National Disaster Management Centre,” explained Shifa. The deputy mayor accused the government of having misplaced priorities, referring to the planned Malé-Hulhulé bridge project. Shifa argued that the residents of Malé do not need a bridge connecting them with the airport while the roads are in such a condition. She also stressed the importance of reaching a mutual understanding with the government and the city council regarding the roads, urging collective efforts to repair the roads. Malé City Council – dominated by the opposition Maldivian Democratic Party (MDP) – was formed by the 2010 Decentralisation Act – has experienced fraught relations with the central government since the fall of the MDP government in 2012. Mayor Mohamed Shihab has complained that the main difficulty facing the council is obtaining the resources required to manage the rapidly expanding city. 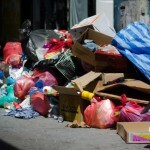 Last week the council complained that is had not been informed before the cancellation of an agreement with Indian firm Tatva to to provide waste management services in the capital Malé and nearby areas. ....so why not fix it. When people are wading water, they knows its bad, you dimmwit. @Good: They can't. Because the government fat-cats are siphoning all the funds to their swiss bank accounts. They can't improve things but can stay in fat salary jobs. There is nothing worse than excuses. Then please stop making excuses and pay my salary. Its been around 2 months already. "Shifa told Minivan News that poor planning and a lack of maintenance had exacerbated the floods occurring across Malé City today (October 30) after heavy downpours in the morning and the afternoon." "Poor planning and lack of maintenance" is the standard operating procedure for the entire country and exactly why it's such a mess.